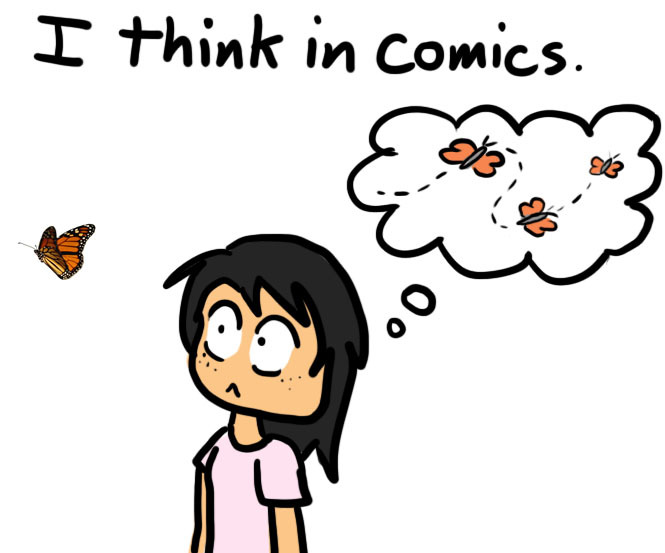 personal | I think in comics. This summer, I interned at Nordstrom, a chain of clothing stores. Not just any clothing stores, but high-end, luxury department stores that sells the latest trends and finest designer goods. So, despite being in tech, I still see some very fashionable people at work. This wouldn’t do. As I’ve mentioned before, I’m not very fashionable. If I was to work at a company that hopes to be the fashion authority, I had to step up my game. I don’t know how to match clothes. I don’t know what fits me. I have no idea how to put an outfit together. I’ve gotten away with it at work by wearing dresses, like, all the time. It’s just one item and I don’t have to think about it! I’ve used Pinterest in the past to brainstorm art and photography ideas. Why couldn’t it work for fashion? All the outfits I found seemed designed for those gorgeous, long-legged models who you could dress in a garbage bag and still make it work. My body type is a little less forgiving. It was time for more research. I started reading the female fashion advice subreddit. I got a headache trying to process all of it. It was time for the next step. I enlisted the help of my fashionable friend from LA. We ended up going to Nordstrom (intern discount, yay!) where she encouraged me to find my own personal style. It was a 180 from my previous shopping experiences with my family. So this was a totally new, self-empowered approach to shopping. And at the end of the night, I actually bought clothes. That I actually liked. And they were on sale! Emboldened by my success, I decided that it was time to step it up. This time, I enlisted the help of three friends to help me shop. Three times the people, three times the success, right? And three times the volume, it seems. It kind of became a dress up game for my friends. I couldn’t believe it. My coworkers noticed my sudden change in clothes. Even my mom approved of my new look. So there’s this clothing line called Cabi that has an interesting business model. Basically, Cabi stylists host these “fashion experiences” where the stylist will walk you through that season’s Cabi clothes. Then, you can try on the clothes samples, get fit and style advice, and order any pieces you like. The idea is to have an intimate setting where you and your girlfriends can drink wine, eat snacks, and shop for trendy clothes with a professional stylist. I didn’t even know something like that existed. It was, again, a totally new experience for me. Yeah. I know nothing about fashion. I’m not girly. I don’t even like shopping. The whole affair was way outside my comfort zone. Not to mention that I was probably the youngest person there– Cabi seems to be more popular with the middle-aged crowd. After the stylist presented all the clothes, we were given the chance to try them on. Might as well just go for it, right? I started picking random items from the rack and trying them on. Much to the delight of the middle-aged ladies around me. The stylist helped me out. Believe it or not, though, the stylist was super helpful! She gave honest advice and never pressured anyone into purchasing clothes– even telling people not to buy if she thought the piece didn’t fit. With her help, I ended up finding some clothes that I really liked! I asked the stylist if I could place an order. I felt bad for the stylist, but damn! I had paid for next semester’s tuition that morning. I did not have that money to spare. I ended up buying just a skirt. At a steep discount. Because I’m still in grad school, goddammit! In the end, though, I’d say this summer was a success! For the first time, I actually tried to learn how to dress myself. My coworkers have been very entertained by my quest for fashion. Deep down, though, I think my clothing preferences have remained the same. Sorry, mom– the sports shorts and tank tops aren’t going away anytime soon. It’s the truth. I’ll see the world and think of how it’d look as a comic. A real-life circumstance could also make a funny comic. These are the thoughts that run through my mind. Life in panels. Life in sequential art. This summer, I turned these thoughts into reality. (Or, more accurately, reality into poorly drawn cartoons.) I went on a 6-week exchange program to Germany, and blogged about it here. So I love comics. That much is clear. As a first post on a blog, however, proper self-introductions are in order. I’m Vy. 18 years old, Vietnamese-American, about to start my freshman year in college. In two days, I’ll be moving up to the grand ol’ city of Boston to attend Northeastern University. You could say I’m just another kid on the brink of adulthood, unsure what to do with their life, stuck between maturity and the desire to dress up in Harry Potter robes. It’ll be chaotic. It’ll be stressful. It’ll be awkward. It’ll be documented here. And that’s what this blog is all about.